The Modzitzer Rebbe Shlita is currently visiting America. In his visit to Lakewood, he came to the Yeshiva Toras Emes, where he made a "Tish" for the young cheder students. What a joy to see young boys singing somewhat complex Modzitzer niggunim, together with their rebbes [teachers]! In the 8-1/2 minute video which follows, you can see the boys singing a Modzitz tune as they greet the Rebbe, the Rebbe saying an age-appropriate Dvar Torah in Yiddish, followed by the Modzitz choirleader's rendition of one of the Rebbe's niggunim, Libi U'besari. Then there are some more niggunim, including a finale as the Rebbe distributes cake to the boys. Enjoy! Oh, and thanks to the Lakewood Scoop for this wonderful video! 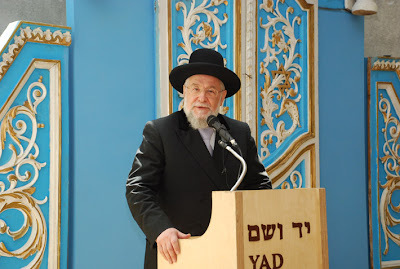 Today was 2 Kislev and the 47th yahrzeit of the Rosh Yeshiva, Rabbi Aharon Kotler ztvk"l. Read more about him at our earlier post, here. In honor of his yahrzeit, we present the following two "travelling" stories [from Revach], plus a Dvar Torah from him on the Parsha. Rav Aharon Kotler zt"l, the Rosh Yeshiva of Lakewood, was preparing to travel to Eretz Yisrael for a visit. Meanwhile, Rav Aharon’s talmidim made their own preparations to accompany him to the airport. When Rav Aharon found out about their plans, he made known to them that he preferred that they remain in the yeshiva and adhere to their normal learning schedule. On his way back to Lakewood from a talmid's wedding in New York City, Rav Aharon Kotler arrived at the train station and realized he did not have any money to purchase a ticket. Without any viable alternative at that hour, he decided to stand on line at the ticket-purchasing counter, relying solely on Hashem for help.The line grew shorter and shorter, as his turn was quickly approaching without any help in sight. Rav Aharon was not concerned, and just continued to learn, while waiting patiently without any worries. The person in front of him purchased his ticket and now it was his turn. He still didn't despair and calmly started walking towards the counter as if he had no problem, completely confident in Hashem's salvation.As he approached the counter, a talmid came rushing towards him. He was so happy to see him, he began screaming "Rebbi Rebbi!" Rav Aharon asked his talmid if he could loan him the amount he needed for the ticket, which he did. He took the money paid for the ticket and went home all without batting an eye. Rashi says that he was tired because he had just committed a murder. The Midrash states further that Esav had committed other serious sins on that day, including adultery and idolatry. The birthright did not give its bearer only material rights, but also (and primarily) spiritual responsibilities. What Kohanim and Levi'im were, later in history -- "For the lips of the Kohen should safeguard knowledge, and people should seek Torah from his mouth" (Malachi 2:7) -- the firstborn were in Yaakov's and Esav's time. It was these responsibilities that Esav rejected when he spurned the birthright, and he thus demonstrated his attitude towards spiritual matters. By telling us that Esav spurned the birthright, says Rav Kotler, the Torah is informing us of the root cause of all of his other sins. The details of Esav's sins do not matter; what is important is that Esav had an improper attitude. (Mishnas Rav Aharon Vol. III, p. 191). "Every song, every letter, every note, is a living monument to the great soul"
Today is 16 Ram-Cheshvan, and the 15th Yahrzeit of Reb Shlomo Carlebach zt"l. In honor of this great event, I would like to share with you the eulogy given at Reb Shlomo's funeral by the then-Chief Rabbi of Israel, Rav Yisrael Meir Lau Shilita. I received it from the Rabbi Shlomo Carlebach Foundation, who noted that the eulogy was translated from Hebrew to English by Rachel Ebner, transcribed for digital use by Reuven Goldfarb, and edited for publication by Rabbi-Chaver David Wolfe-Blank (zt"l). I have done some light editing on it for this blog. I believe that I will not have fulfilled my duty if I do not here serve as spokesman for many who need to beg forgiveness and pardon from HaRav Shlomo Carlebach. We did not relate to him with enough respect, we did not value him sufficiently, we did not stand strong enough to guard the honor which he never sought but was truly entitled to. I ask forgiveness and pardon in the name of those who are present here and in the name of the many who should have been present here but did not come. They will come, however, and they will come to value this great soul who moved among us: a soul from the world of nobility and purity, the world of awe, of melody, and of intimacy with the Divine. Perhaps the name Carlebach is not familiar to the young among you, but those of us who are older know Reb Shlomo's roots: he came from one of the most aristocratic families in the world of Torah, the world of Judaism before the Akeida, before the destruction. Reb Shlomo belonged to all worlds, even though sometimes it appeared he belonged to none -- sometimes he was so isolated and so lonely. More than once, when we'd meet on an airplane, it seemed that he had no ally but his guitar. But he belonged to all worlds. He was a true ben-Torah in the world of the Lakewood Yeshiva, alongside HaRav Aharon Kotler zt"l, who today stands ready to greet him. 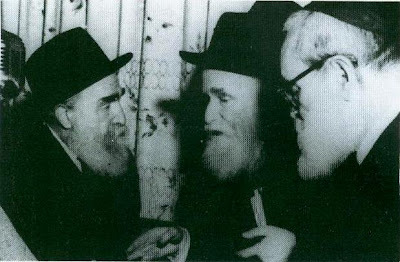 Reb Shlomo was a household member in the home of the Lubavitcher Rebbe zt"l, who today stands ready to greet him. And Reb Shlomo was a Breslover, and, no doubt, Rebbe Nachman rejoices today with this great soul arriving in the secret, lofty places. Reb Shlomo was a member of a very illustrious family, a family of deep believers. His uncle, R. Yosef Zvi Carlebach zt"l, wrote one of the last postcards of his life perhaps the very last to my father. Both of them, friends in heart and soul, rose heavenward in the storm in Europe fifty years ago. R. Yosef Zvi Carlebach wrote to my father: "As for me, I am amidst my congregation." He had been advised to embark for the safety of America, and he answered my father - we have the postcard – "I am amidst my congregation; I shall not leave my congregation." Such was his devotion for the community of Israel. I see Shloimele in Russia, before any of us had the chance to get there, where souls were being lost at the murderous pace of a thousand a day. And this young man showed up with his guitar. They'd not seen anyone looking like this in a long time - a beard, payot and tzitzit. And from these encounters was born that song that the whole Jewish world knows: Od Avinu Chai (Our Father still lives). Shlomo came to them as if to tell them: "The People of Israel lives!" Why? In what zechut [merit]? Because our Father lives. They didn't understand his words, but they understood his soul. They absorbed him without understanding his texts no dictionary is needed for the language of feelings. They understood and absorbed Reb Shlomo's language more than they did our rabbinic speeches. Reb Shlomo had a language called the language of the heart. You just sang Mizmor L'David, a Psalm of David. More than twenty years ago, I had the honor of hosting Reb Shlomo until four in the morning in my house on Vermiza Street in Tel Aviv. And he said to me, "Rav Yisrael, you are a child of the Holocaust. I want to sing you a melody." And there, on the spot, he composed a melody which had never been published anywhere, to the words of one Torah verse. And that verse was and it is with it we accompany him today: "Even when I am walking in the valley of the shadow of death, I fear no evil, for You are with me." This "You are with me" is what sustained Reb Shlomo all over the world: on the campuses of Berkeley; all the campuses of the east and the west; the campuses of England, France, Austria, Germany, South Africa, and Australia; in places so far-flung that the name of Israel was barely remembered there. Reb Shlomo stood up and returned so many people to the embrace of Judaism and helped so many turn back from distorted lives. I remember the first time Reb Shlomo appeared at Zion-America House, which at the time still had no ceiling and was wide open on top. He began with the song Esa Einai (I lift my eyes to the mountains), and we answered him with Shomer Yisrael (Guardian of Israel, guard the remnant of Israel), and… he sang for us Yisrael, B'tach BaShem, Ezram uMaginam Hu (Nation of Israel, trust in the L-rd; He is [Israel's] Help and Shield). And then he promised us the promise of Od Yishama...Kol Sasson veKol Simcha (There will yet be heard...the voices of joy and gladness), then V'hanchilaynu Hashem Elokeynu b'eahava uveratzon Shabbat Kodshecha (In love and grace, He has given us His holy Sabbath). He made us all take a leap into the holiness of the Sabbath, and today we accompany him into the day that is all Shabbat and peace, to the life of eternity. Reb Shlomo was a great soul, a quintessential soul. Only once in a generation does such a soul turn up who knows from whence it was drawn? From the roots of higher worlds. I want to tell you something. There are four species: the Etrog, the Lulav, the Hadas (myrtle), and the Arava (willow). Their initials spell out Aaleh (I shall go up). Reb Shlomo, this is the day of your ascent. The Hadas is called a branch of interwoven foliage. What is special about the Hadas? Three leaves in a row emerge from the stalk at the same spot. The three leaves are three hearts. These are the three loves about which we have been commanded. First of all: V'ahavta et Hashem Elokecha (You shall love the L-rd your G-d); this is one leaf of the Hadas. Secondly, V'ahavta l'Reacha kamocha (Love your neighbor as yourself); this is the second leaf. And the third is uverachta et Hashem Elokecha al ha'Aretz hatova asher natan lach (Bless the L-rd your G-d in the good Land which He has given you) - the love of the Land of Israel. Now it is not the case with all of us that the three leaves line up. For one person, love of Torah might be stronger than his love of the Jewish people. Another person's love of the Jewish people might be stronger than his love of G-d. And there are those whose love of the Land might be stronger than both other loves. The Rambam calls a Hadas of this type one whose leaves are not equal a Hadas shoteh (a foolish Hadas). Reb Shlomo, you were a wise Hadas, whose sweet fragrance was widely diffused. You were a Hadas who possessed all three leaves, and all of them suckled from the same inner point that is in all of Israel, who is hewn from the Rock. You had powerful love for the Holy One, Blessed be He, boundless love of Torah, and an unparalleled love for Israel. Reb Shlomo's love of Israel, and love for every grain of dust of the Land of Israel. How to put it? He was connected to every letter of Torah, to every soul in the nation, and to every clump of dust in the Land. Today, as with a good name you go to the higher world, surrounded by the love of your friends, your students, and people who esteem you, the clumps of dust of the Holy Land that you so love will sing sweetly for you. And your prayers at the Western Wall, your Friday nights at the Western Wall it is into your own Sabbath eves of Rav lach Shevet (Enough dwelling in the vale of tears, come arise from the ruins), into your own Mikdash Melech (Temple of the King) that you are entering today in the higher worlds. I can see in my mind's eye the Tzaddikim and higher Holy Ones who are right now greeting your soul. You brought the spirit of Jewish life into so many Jewish souls who were on the threshold of danger, of getting lost, of disappearing. May your pure, refined soul be bound up in the bouquet of life. Alas, alas for those who are gone, no longer here. You had a soul the likes of which is only seen once in many generations, and it had the power to sustain numerous souls in Israel. May you be granted in the higher world enjoyment from your daughters, whom you always praised so highly; may you attain faithful houses to carry on your name in Israel with honor and splendor. Your songs are living monuments, unlike a stationary tombstone. Your music is a living, ongoing monument. The entire Jewish world in this generation and for generations to come are building up for you a memorial of sons and daughters I shall give him an eternal name which cannot be cut off. Every song, every letter, every note, is a living monument to the great soul whom we were privileged to know, the soul of HaRav Shlomo Carlebach, may the beloved Tzaddik be remembered for blessing, for eternity.